In a world of constant chaos and conflict, homes are often the only places of peace where souls find rest. 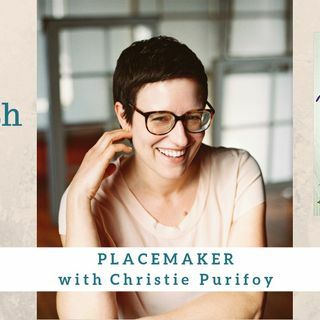 Christie Purifoy shares how she cultivates places of comfort, beauty and peace in her new book, Placemaker. Christie Purifoy is a wife of 22 years and mother to their four children. She earned her PhD in English Literature at the University of Chicago before trading the classroom for an old farmhouse, a garden, and a writing desk. Christie is the co-host of the podcast, Out of the ... Más informaciones Ordinary, with Lisa Jo-Baker. She is also the author of two books: Roots and Sky: A Journey Home in Four Seasons. And her brand new book, Placemaker: Cultivating Places of Comfort, Beauty, and Peace. "We are all gardeners.” ~ Christie Purifoy Connect with Christie Purifoy BOOK: Placemaker Enjoy the multitude of topics discussed including Maplehurst, ownership, moving, and roses. Dr. of old books My garden Roses Placemaker Moving Guarding my heart See the trees The wilderness Not belonging Beauty The setting Created Control Humble posture Responsibility Magnolias City Living Maplehurst Plaster Hospitality Beloved Foundation Self doubt Flower garden Family Restoration A bit of earth Gardener What tree to be? New eyes to see Connect with Jonathan Bailor BOOK: The Setpoint Diet "I'm growing joy!" ~ Christie Purifoy #MyStrengthIsMyStory #CreateYourNow #Placemaker Quotes and statements within the interview: "Even in winter, I'm thinking about flowers." "It's all about the roots." "Because I know my life on its own; it's ordinary. It's not necessarily book-worthy." "I just kept searching for some word that would sort of tie all the pieces of my life together." "They are the ones who are willing to sink their roots deep into a place to love it, to take care of it, to change it for the better. But even while they're tending it and cultivating it, they're letting that place affect them and change them, and make an impact on them." "I think of it as a legacy that's been handed down to me." "And that love, I realize now was like a seed planted in me that over time when the season was right, it grew and ripened." "At some point, people will close the book, step outside and listen to the trees, and listen to maybe the God who would whisper to them as they enjoy the piece of shade a tree offers." "But for me, it was always a place where I did not feel that fit." "I think it has helped me just connect the dots of my life." "My life is a good story written by a great author; my maker, our Creator." "The setting of our own story is important, and we get to shape it, and we should recognize how it shapes us." "It's been a process for me of letting go of those rights, but accepting the responsibilities of a place." "But what I have learned here about Placemaking is that we don't do it alone, that actually it's best done in community." "Sometimes a period of living without can really be a gift." "Can I clear space for peace and beauty?" "Let's live by trees planted by water." "God used that place to heal us really and impart His peace to us." "He (Jesus) is the perfect gardener." What has your story gifted you? Flowers "The beauty of the flowers that my father grew when I was a kid, that it never occurred to me, I could cultivate myself or grow myself." "I gather up beauty." Resources mentioned in the episode: Connect with Christie Purifoy BOOK: Placemaker Podcast: Out of the Ordinary Instagram: https://www.instagram.com/christiepurifoy/ "One step at a time leads to miles of greatness!" Ready to see if coaching and a mentorship is for you? It's time you TAKE A.I.M. ~ Action Ignites Motivation. This is FREE for you. Stop trying to do it by yourself. Invest in YOU! You are worth the time!!! ANNOUNCEMENT: Ready to shine your light and tell your story. Please click on MY STRENGTH IS MY STORY. Here you can submit yourself to appear on the podcast or make recommendations as who you would like to hear. This is going to be a beautiful series! Subscribe to Create Your Now TV on YouTube. Listen to Create Your Now on Spotify. Listen to Create Your Now on iHeart Radio. Click here. The Create Your Now Archives are LIVE!! You can subscribe and listen to all the previous episodes here. http://bit.ly/CYNarchive1 and http://bit.ly/CYNarchive2 and http://bit.ly/CYNarchive3 and http://bit.ly/CYNarchive4 and http://bit.ly/CYNarchive5 Contact me at YourBestSelfie@CreateYourNow.com THE NO FUSS MEAL PLAN Instagram @CreateYourNow @Kristianne Wargo Twitter @KristianneWargo @CreateYourNow Facebook www.facebook.com/TheKISSCoach www.facebook.com/CreateYourNow PERISCOPE USERS!!! Click here for ANDROID Users / GOOGLE https://play.google.com/store/apps/details?id=tv.periscope.android Click here for APPLE Users https://itunes.apple.com/app/id972909677 Read more from Kristianne, a contributor to The Huffington Post, MindBodyGreen, Thrive Global, Addicted2Succes, and She Owns It. https://addicted2success.com/success-advice/5-things-to-do-while-waiting-for-success-to-manifest-in-your-life/ http://www.huffingtonpost.com/kristianne-wargo/ http://bit.ly/9amHabits https://journal.thriveglobal.com/how-to-configure-a-sleep-pattern-fit-for-you-d8edd3387eaf#.sniv275c3 https://sheownsit.com/when-failure-is-your-middle-name/ DOMESTIC BEAUTIES (Announcements) 1. Come and let's connect on Facebook - Women Of IMPACT http://facebook.com/groups/thewomenofimpact 2. Create Your Now ~ Your Best Selfie can be heard on iHeart Radio and Spotify! 3. Create Your Now Archive 1 is LIVE! You can subscribe and listen to all the previous episodes here. http://bit.ly/CYNarchive1 4. Create Your Now Archive 2 is LIVE! You can subscribe and listen to all the previous episodes here. http://bit.ly/CYNarchive2 5. Create Your Now Archive 3 is LIVE! You can subscribe and listen to all the previous episodes here. http://bit.ly/CYNarchive3 6. Create Your Now Archive 4 is LIVE! You can subscribe and listen to all the previous episodes here. http://bit.ly/CYNarchive4 7. Create Your Now Archive 5 is LIVE! You can subscribe and listen to all the previous episodes here. http://bit.ly/CYNarchive5 8. NEW Website! Go check it out and tell me what you think. http://www.createyournow.com 9. Sign Up for The A.I.M. Academy! You will be the first to learn all about it. http://createyournow.com/m-academy-2 10. Schedule a Discovery Call. This is a free 30-45 minute call for those serious about coaching with me. 11. Newsletter and Library: If you desire to get weekly emails, be sure to sign up here so you can stay connected. http://createyournow.com/library Cover Art by Jenny Hamson Music by Mandisa - Overcomer http://www.mandisaofficial.com Song ID: 68209 Song Title: Overcomer Writer(s): Ben Glover, Chris Stevens, David Garcia Copyright © 2013 Meaux Mercy (BMI) Moody Producer Music (BMI) 9t One Songs (ASCAP) Ariose Music (ASCAP) Universal Music - Brentwood Benson Publ. (ASCAP) D Soul Music (ASCAP) (adm. at CapitolCMGPublishing.com) All rights reserved. Used by permission.